The KARIN range * of Japanese incense sticks offer traditional fragrances inspired by the 10th century novel 'Tale of Genji' (historically known as the world's first novel, and still in print today). This range is subtle, noble, luxurious and refined - reflecting the books focus on olfactory culture. Swallows in flight is a noble and distinguished fragrance imbued with sensuality - featuring rich top notes of Jinkoh (Aloeswood). Jinkoh is the name given to the best quality Aloeswood (also called Agarwood and Eaglewood) which is sourced from official stock - validated by this products certificated status from CITES - T-SU-09-101111(W). * The Karin range features: Forest of Flowers (Harmony), Perfumed Prince (Seduction), Moonlit Night (creativity), Swallows in flight (Sensuality), Ruby (Freshness) and Pearl (Sweetness) - all available in stock from Vectis Karma. 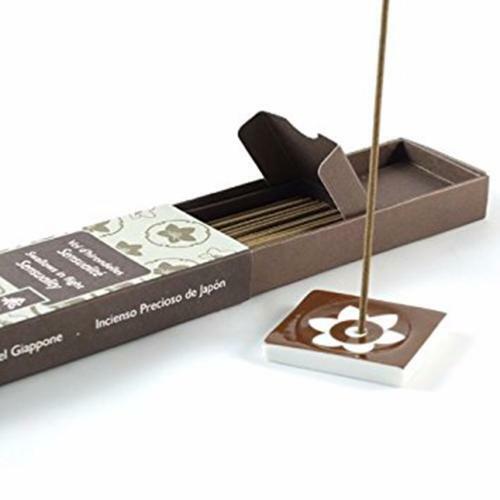 This is our preferred incense so far, and it's a regular gift to beloved friends! Very smooth incense - beautifully balanced. The Karin range is an excellent balance between quality and price. Already tried seduction which is wonderful and this one is equally good. If you like deep scents you'll love this. A really rich gorgeous scent of agar wood with chocolatey undertones.